Are you longing ride endless miles of snow and enjoy an unforgettable experience? If so, then snowmobiling in Québec is for you! Offering a delectably thick snow cover, a network of 33,000 km of trails and the freedom of the untouched wilderness, Québec is understandably a top destination for snowmobiling, a sport invented right here. The groomed and sign-posted trails criss-crossing the province offer a full range of services and accommodations for every taste. Plan your trip by consulting the various snowmobiling information sources available. Whether you’re looking for info on snowmobile trail permits, snow conditions, trail maps or accommodations, our useful links will provide the answers to your questions. Happy trails! What type of snowmobiler are you? The first “snow machines”—the granddaddies of the snowmobile as we know it today—rolled off the Bombardier assembly line in 1936 and had a seven-passenger capacity. True snowmobiles weren’t marketed by Bombardier until 1959–1960. For those who love pure nature and who thrive in the wilderness, Québec, with its wide-open spaces, gives you a chance to glimpse wildlife in all its glory. The province’s breathtaking scenery will fulfill your wildest dreams. Take in stunning views from the mountaintops. Criss-cross the St. Lawrence, the Saguenay fjord and the majestic Lac Saint-Jean—you’ll witness beauty like nowhere else in the world. Québec’s trails offer thrills galore for snowmobilers with a thirst for adventure and new horizons. 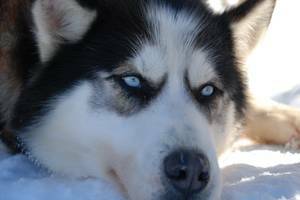 Glide over frozen lakes, explore the vast boreal forest or travel to magical spots inaccessible by car. The most memorable adventures await you! The Northern Trail (1,640 km / 1,018 mi. 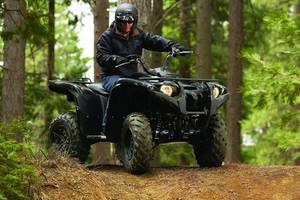 ), which runs from Tadoussac to Blanc-Sablon along the Trans-Québec 3 (TQ3) trail, is ideal for snowmobilers in search of pristine wilderness and wide-open spaces! 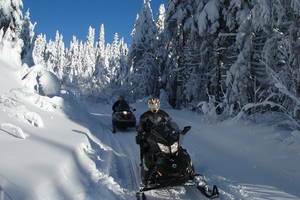 It incorporates the Route Blanche snowmobile trail promoted by Tourisme Côte-Nord. This 800-km (497-mi.) loop, from Mont Saint-Pierre in Haute Gaspésie all the way to Mont Sainte-Anne, boasts a panoramic view of Percé rock. You can traverse Gaspésie two ways—via Murdochville, the copper town, and via the Chic-Choc Mountains, one of Gaspésie’s prettiest gems. The Summits circuit (380 km / 186 mi.) allows you to cover a large portion of the Monts-Valin area via access to a series of five mountains with incredible lookouts over Saguenay–Lac-Saint-Jean. A 760-km (472-mi.) loop amidst lakes, hills and forests, stretching from Maniwaki, through the northern sector of the Vallée-de-la-Gatineau all the way to the La Vérendrye wildlife reserve. This 914-km (568-mi.) loop links the cities of Rouyn-Noranda, Lebel-sur-Quévillon, Val-d’Or and Ville-Marie. It’s no secret: Québec is brimming with fabulous restaurants. What could be better after a day snowmobiling than to sit down to a gourmet meal and relax in a friendly, cozy atmosphere? Various accommodation packages are available along the circuits and trails. Whether you’re looking for a cottage, B&B, charming inn, hotel or an outfitter, you’ll find everything you need. And why not take the opportunity to relax in a Nordic spa as you watch the snow fall down around you?